The Okinawa Institute of Science and Technology Graduate University Japan is accepting applications now for International OIST Research Internship Program In Japan. The OIST Internship 2019 is for all students and graduates from the world and can apply for every field internship at Okinawa Institute of Science and Technology Graduate University Japan. In addition to the OIST Doctoral Program, seminars, and workshops, the OIST Graduate School offers education and research opportunities through a system of undergraduate and graduate placements as Research Interns. These short-term placements as a Research Intern give a select few talented students the opportunity to gain experience in a particular laboratory or to learn a specific technique. They work under the direction of a Professor at OIST and contribute to the research activities of OIST. The OIST Graduate University shall conduct internationally outstanding education and research in science and technology, and thus contribute to the sustainable development of Okinawa, and promote and sustain the advancement of science and technology in Japan and throughout the world. Those candidates are eligible to apply for OIST Internship 2019 students who are enrolled at graduate or undergraduate programs in universities, colleges, junior colleges, and vocational schools in Japan or any other country, or recent graduates of such institutions. Bachelor year 3 and 4 and master year 1 & 2 students are particularly encouraged to apply. Currently, enrolled students must have approval from their home institution. If you are currently a student, please confirm with your institution. OIST interns must agree to and follow the OIST agreement. OIST Internship 2019 agreement takes precedence over any other university agreement. The Graduate University aims to train researchers who will play important roles in the international scientific community at leading scientific institutions in the public and private sectors. Accordingly, the program will make it a principle to recruit candidates with the potential and motivation to become leaders in scientific research on the international stage. Academically applicants should be at least among the top 20% of students in their program. The Okinawa Institute of Science and Technology Graduate University Japan seek interns who are highly motivated by the excitement and potential of the cutting-edge research that is possible at OIST, who have the curiosity and academic ability needed to excel in their chosen areas of study, and who have the capacity for independent research and original thinking. Successful applicants will also require proficiency in oral and written communication skills in English for advanced study in science, and the ability to interact effectively with people from a wide range of backgrounds. The tenure of Research Intern placements is between 2 and 6 months, typically at least 10 to 12 weeks. Tenure will not normally be extended. Interns may not take extended leave during their time at OIST, and are expected to work full time on their project. Internships may begin and end at any time during the year, but application deadlines depend on the desired starting date of the OIST Research Internship 2019. OIST provides a living allowance, commuting support where necessary, and accommodation either on campus or nearby. Successful applicants will receive a Living Allowance of 2,400 JPY per day (weekends & holidays excluded) while at OIST. OIST will pay for one direct roundtrip travel for Research Interns between the home university or institution and the research unit or other facilities where the internship will take place (usually Okinawa). The travel dates must be as close as possible to the term of the placement. Travel for successful applicants is arranged by the OIST Graduate School. The Student Support Section of the Graduate School will provide support for Research Interns at OIST with matters such as housing, visa acquisition, insurance procedures, and local registration. OIST regrets that support is not available for dependents, family members, and persons other than the student. All application documents, including the letter of recommendation, must be sent by the deadline listed below for your intake dates. Application periods correspond to time ranges in which your internship starts. (The deadline for your application depends on the day you plan to start your internship. For example, if you plan to start May 1, your “Desired Starting Date” is in the range of Apr 1- Sep 30, so the deadline is Oct. 15). 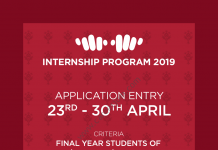 OIST Internship 2019 Intern places are awarded on a competitive basis. Deadlines for application are listed in the table above. Selection is highly competitive, and depends on suitability of the intended research, a student’s academic background, and available funding and space. Professors accepting students under these programs will review the student’s qualifications, research capabilities, and academic training in a comprehensive manner. Information is available below regarding research units that can provide research intern positions in any year, and the type of projects offered. Please keep in mind that listed numbers indicate maximum availability, and only a small number of the total open positions are filled in each round. Applications from currently enrolled students must be supported by a recommendation letter from the Dean, Head of Department, or supervising professor of the program they are enrolled in. The applicant is notified of the receipt of an application within an hour of submission. [As some of these notifications are automatically generated, please check your bulk or junk mail folders if you do not receive an expected notification to your inbox.] Successful applicants will be notified of acceptance once a decision has been made. OIST Graduate School will send results by email to successful applicants, typically within 3 months after the submission deadline. For successful applicants, confirmation of internship participation must be made months in advance as ample time must be allowed for the issue of a visa and other necessary Japanese government documentation. Academic Transcript: Upload a scan of your current academic transcript in PDF format. Unofficial partial transcripts are accepted for those who have not yet graduated. Applicants should be among the top 25% of students. Recommendation Letter: Applications from currently enrolled students must be supported by a recommendation letter from the Dean, Head of Department, or supervising professor of the program they are enrolled in. Please consider that the request for a recommendation letter will not be sent until your application is submitted, so keep this in mind as you plan your application timeline. The application system will ask him/ her directly, using the email contact details that you provide. Depending on account settings, our automatically generated email may be filtered to junk or bulk mail, so in case of a delay, please notify him/ her to check beyond the inbox to insure timely processing of your recommendation letter. Please arrange for the consent of that person before submitting their details in the form. Be sure to also confirm the e-mail address before entering it in the web-form. Applicants will be automatically notified by the application system when a letter of recommendation is received. ID Photo: Upload a recent photo, showing your face from the front in standard passport orientation. Once you have obtained all the documents above, please attach and apply to the program through this APPLICATION FORM GIVEN BELOW.